What is a Secured Home Loan? Borrow against your home equity for better terms on a loan or line of credit. 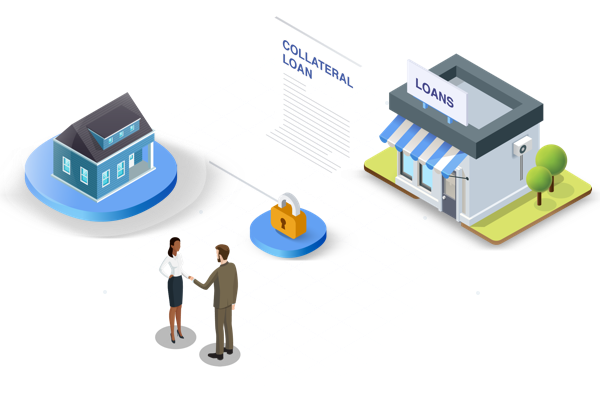 A secured home loan (or home collateral loan) is a loan where a lien is placed on your home, securing the loan for the lender in case you find yourself unable to make payments. Home collateral loans are also called home equity loans, or second mortgages, since how high your loan can be is calculated as a percentage of your first mortgage. For example, most second mortgages are for 10% of the value of your home, and most lenders require that at least 20% of your first mortgage is paid off to be approved. Home equity loans come in two kinds: regular home equity loans (HEL), where you get a lump sum and pay a fixed interest rate, and a home equity line of credit (HELOC), where you draw portions of the loan as you need them. Payment terms can be between 5 - 30 years (avg. 15). With a HELOC, draw periods are typically 10 years, and your payments during this time can be as low as the interest only. Afterward, payments are amortized, and for periods of 20 - 30 years. In general, home collateral loans will have lower rates than other conventional loans, since they’re secured by collateral. Exactly how low your rates are will depend on whether you’re taking out a HEC, which will have a fixed rate, or a HELOC, which will have an adjustable rate, followed by amortized payments. They'll depend as well on the size of the loan, and on the strength of your financial situation. The better your credit score and DTI (debt-to-income ratio), the better your rates will be. Since home collateral loans are secured, it’s relatively easy to get approved for one. How high a lender will require your credit score to be will usually depend on how much home equity you have (how much of your mortgage is paid off). In general, however, most lenders will only require a credit score of 620 to approve you for an HEC, and probably a little higher for a HELOC. As for your debt-to-income ratio, a 43% DTI is usually low enough to get approved. Home collateral loans are based on your home equity, so depending on the value of your home and how much of it you’ve paid off, you may be able to find a lender who will give you approval even with bad credit. This can be a dangerous route, however, since it’s your home that’s on the line. If your credit is bad, the best option is to improve it before seeking a home collateral loan. And this can be done simply be paying your bills. Even a single outstanding charge on your credit report will hurt your score significantly, so just by taking care of any late payments you may have you can increase your credit rating considerably. Home collateral loans can be very useful, but you need to be careful how you use them. You’ll want to make sure you have a good payment plan before you take the risk. For example, it‘s wisest to use a home collateral loan as an investment of sorts, like renovating your house to increase its value, or buy a second home. You can also use to home collateral loans for debt consolidation, taking advantage of its low rates to pay off other higher-interest debts. Even investing in a family member’s education, for example, in the long run can lead to a stronger financial situation that will justify the risk of using your home as collateral.